If crashing waves, sand-pebbled beaches, blue umbrellas, and pine forests are on your list, this earthy Greek paradise on the Aegean sea is worth more than a daydream. The island’s hypnotic sapphire waters, emerald forests, white-washed homes, and charming chapels cultivate an atmosphere of calm. And the world-famous cheese pies, olive groves, and plum orchards satisfy the soul (and the stomach). It is the Mediterranean, after all. 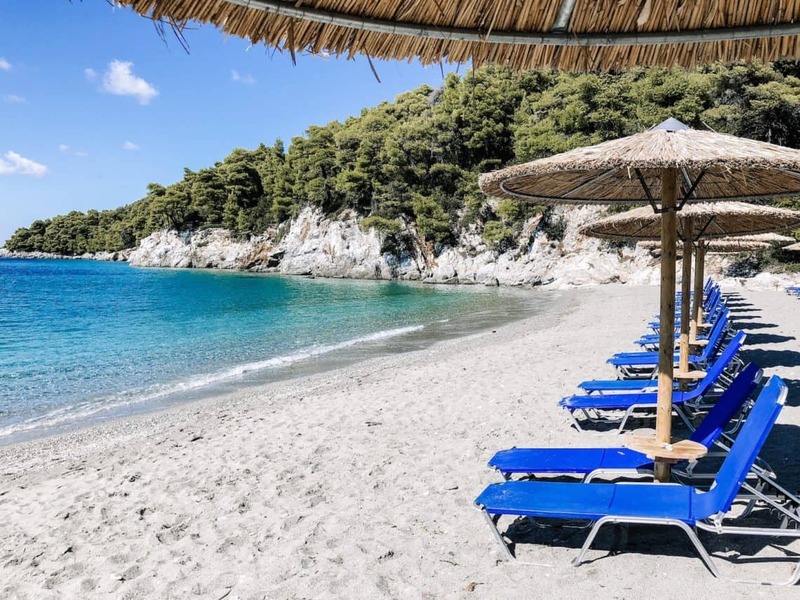 If you’ve seen Mamma Mia!, then you probably already know how intoxicatingly beautiful this pine-covered Greek island is because the 2008 Hollywood musical was filmed around the beaches and cliffs of Skopelos. And although this off-the-beaten path island remains one of Greece’s best kept secrets, the film continues to inspire the travels of adventure-seekers, families, couples, and film buffs. Journey to this epic paradise to traverse the same beaches where Sophie (played by Amanda Seyfried) gets married, Donna and the dads bid Sophie and Sky goodbye, and where Sophie, Bill, and Harry jump off the high cliffs and into the clear blue waters. This Mediterranean island is a little slice of heaven. And while you’ll there, we guarantee you’ll be humming some of the ABBA tunes that make Mamma Mia! so special. Follow our tips below to discover the ABBA-solutely (I couldn’t resist!) best ways to explore this enchanting island. Part of the charm of Skopelos is that it does not have an airport. The good news is that there are daily ferries from Agios Konstantinos, a port town in central Greece, and from the port of Volos. From these ports, most visitors ferry to the Skopelos Town main port, but it’s also possible to arrive in Glossa, the island’s second port. In the summertime, you can also fly into the nearby Skiathos Island Airport and take a short 15-minute ferry ride to Skopelos. This is our favorite way to get to the island. 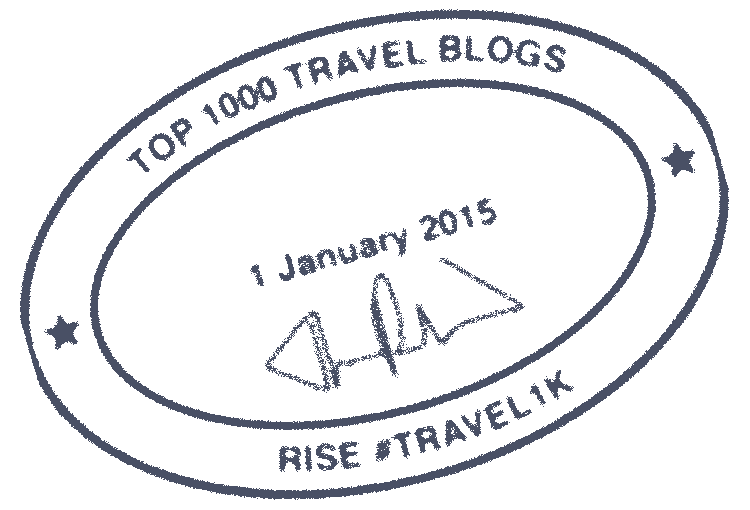 For more information on Greek Ferry schedules, click here. Pro Tip: The island has a lot of hills, and forests, so if you intend to venture far from your hotel, you may want to consider renting a Jimney (a jeep!) while you are there and don’t forget your comfiest runners or hiking boots to venture off onto the path less taken. 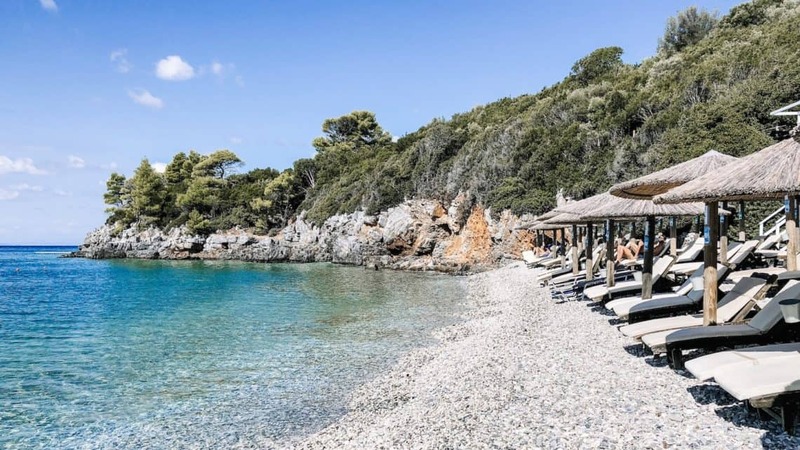 Nestled on the south side of the island, the Adrina Beach Hotel combines the beauty of the local landscape with the charms of Skopellian architecture. The rooms are spacious and clean, with modern touches and romantic seaside balconies. 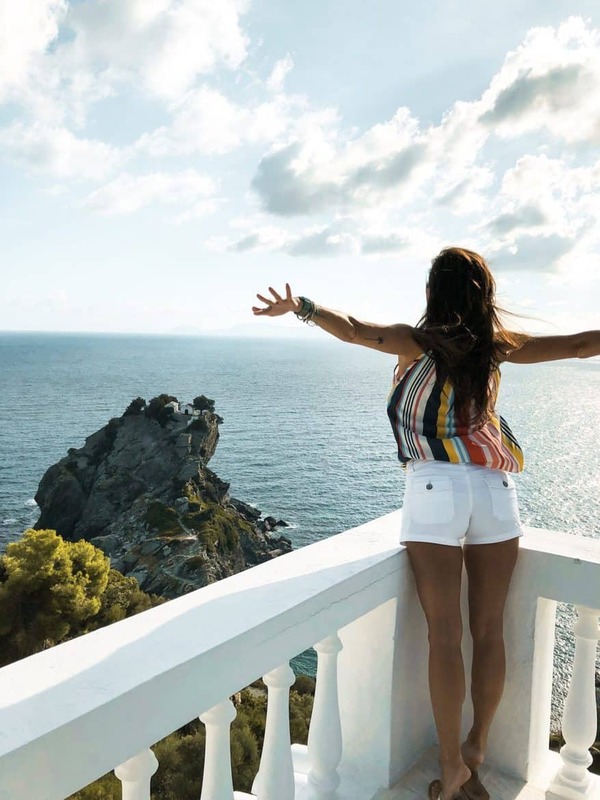 The luxe hotel is family-owned, and surprisingly affordable with an elegant sand-pebbled beach (bring water shoes to more easily enjoy your dips in the Aegean Sea), plenty of sunbeds, gardens, salt water pools, dining options (some of the island’s freshest fish), and more. You’ll also definitely want to book a sea-side room – it’s more than worth the extra green to have all that extra blue in your view. 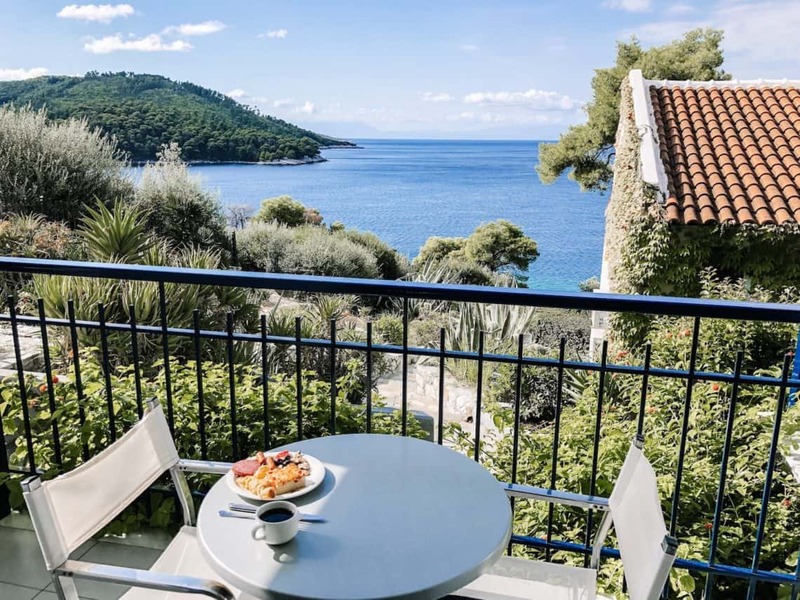 It’s the perfect, quiet retreat for those looking to escape the tourist traps (that’s probably why many of the Mamma Mia cast stayed there during filming). You can float or snorkel out in the sea all afternoon or channel your inner Meryl Streep while watching your favorite (or even BOTH!) Mamma Mia! flicks on your irresistible private patio. *Note* The island of Skopelos does have an abundance of bees and wasps. Be sure to bring some repellent if you think this will be an issue for you – especially if you’d like to enjoy a meal outside. They are especially attracted to sweets and meats. While this can be annoying at times, the upside is you’ll have the chance to try (and take home) some of the best honey in the world! The town of Panormos is just a 10-minute walk from the hotel, where there are plenty of additional restaurants/tavernas so you can mix it up each night. Our favorite part about the Adrina Beach Hotel is the staff, who go out of their way to provide a welcoming atmosphere and four-star service. And those gorgeous sun beds on the beach? You won’t have to fight for one, making the vacation all the more relaxing. Wifi can be a little spotty (it’s best out on your patio or down by the pool), but let’s face it, when you’re in paradise, do you really want to spend your time attached to a computer or Facebook? Nah, we didn’t either. Pro Tip: There is a bus stop right outside the hotel where you can catch a lift to the nearby beaches and Skopelos Town for just 3 Euro. Known as the “Mamma Mia Beach,” Kastani Beach boasts enchanting turquoise waters and is surrounded by lush pine forests. The Mamma Mia cast spent over a week filming here, and it is the site where Sky (Dominic Cooper) and Sophie sing the steamy Lay All Your Love On Me, as Sky’s sing pals dance on the pier. It’s also the location where Christine Baranski performs the upbeat number Does Your Mother Know at the beach bar. Both the pier and bar were built for the film, and were torn down, though the beach has a proper bar (with plenty of tunes) on site as well as umbrellas to rent for 7 Euros, so that you can spend a sand-and-sun-soaked day on this iconic Greek beach. Pro Tip: Bring your snorkel gear so that you can see the little shimmering fish that play beneath the waves. It’s also one of the best beaches to visit in the late evening (in the summer the beach stays light till around 8:30 pm, so you can enjoy a late dip!). If Kastani ends up being super busy (as it can be in the summer), opt for the equally beautiful Milia Beach nearby. This quiet, off-the-beaten-path beach has seen better days, but it remains an excellent site for a quiet dip or picnic lunch. The olive-tree lined shore, is home to a pebbled beach and cerulean waves. This beach was used as the background for several scenes in Mamma Mia, such as when Sophie reads her mother’s diary out loud to her friends. Pro Tip: Make sure you bring some drinks/snacks here and your own umbrella. There are no facilities here. The beach is typically pretty empty before 11AM so if you’re looking to get in some quality me time…this is your time. Also bring along some beach shoes if you can to make the swimming even better! 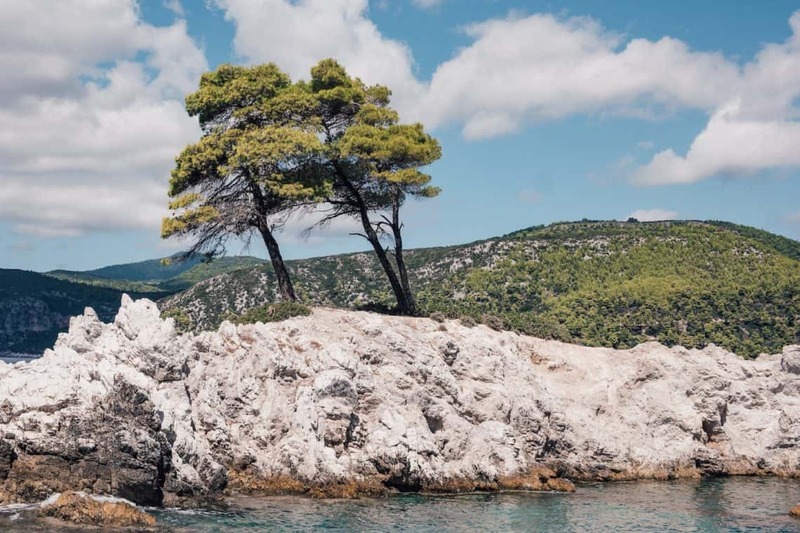 Located just 8km from Skopelos Town, Agnontas (meaning 3 pine trees) is a beautiful, but small beach where the pines converge on the sea. Accessible by bus, this charming beach faces directly west (making it the best place on the island to be at sunset). It’s a great place to bring the kids (hardly any waves), or to enjoy some fresh caught fish in one of the beachside fish tavernas (where you’ll find locals dining on Illex Squids). Koralli and Pavlos are both great options for dining here! And if you’re looking to get the full Mamma Mia experience, the fishing port is also the location where Meryl Streep performs Money, Money, Money. Pro Tip: The sunbeds are free here! Enjoy the sun basking. Skopelians are masters of the cheese pie. When in Skopelos, you have to order a traditional Skopelian Cheese pie at least once (odds are you’ll order two. Or three). These feta-filled, twisted pies are the true culinary gem of Skopelos. The best place to order one is at Michali’s a Greek cafe in Skopelos Town, where each pie is handmade by Michali’s mother at the time of your order. Originally designed to lure French tourists back in 1953, Agnanti is the place to go for lunch or a sunset meal. Located across the island in Glossa, high up on the hillside, this culinary gem delivers impressive Mediterranean fare and world-class views Stop by for a glass of wine or ouzo and try the Feta Me Meli or the local squid! Pro Tip: Cap off your meal with some orange and mint sorbet! You won’t regret it. Then stroll through the car-less streets and enjoy the beautiful gardens. For light lunch fare and an incredible view, pay a visit to Cafe Bar Thalassa, located high up in old town Skopelos by the churches. Treat yourself to a delicious greek salad, a refreshing smoothie, or come in the evening for a cocktail (as Meryl Streep did when she filmed on Skopelos). Try the local beers of Mythos and Alpha. The prices (and the hike up) are a little steep, but the view is one-hundred-percent worth it. 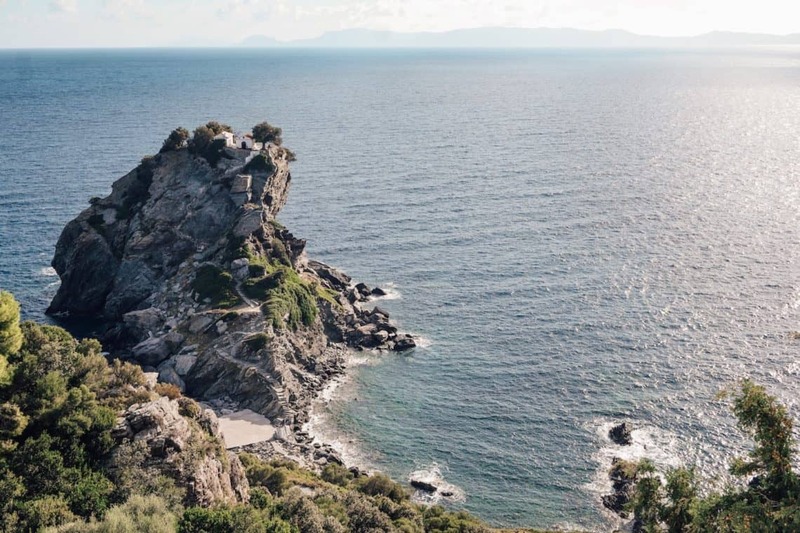 Perched high on a towering rock formation above the sea, the Church of Agios Ioannis Kastri was featured in both Mamma Mia! And Mamma Mia! Here We Go Again. You’ll recognize it as the site where Sophie gets married. To access the whitewashed church, visitors have to climb roughly 200 stone steps to the top, and the view does not disappoint. The chapel at the top is not the same one as in the movie (the crew built an alternative chapel on top). Stroll the stunning grounds and imagine yourself signing the ABBA hit “The Winner Takes All” (performed by Meryl Streep (as Donna) and Pierce Brosnan (as Sam) at the base of the formation. If you are looking to break a sweat, consider tackling one of the most incredible day-hikes in all of the Mediterranean. Reward yourself with breathtaking views of olive tree groves and thick pines forests as you ascend to the top of Delphi Mountain at 681m (where you’ll be treated to excellent 360-degree views of the sea). Pro-tip: If you are hiking in the summer, make sure to bring plenty of water and sunscreen! And keep your eyes peeled for the Sendoukia tombs at the top (no one quite knows whether they belonged to pirates or Romans). You can find hiking maps at the main port in Skopelos. There is no better way to get to know Skopelos then to take a walking tour with a local guide. Wind through the streets of the postcard-perfect old town, stroll past whitewashed churches, get the insider knowledge on the go-to bars, marvel at local street art, and get the insider secrets (such as how the locals keep pesky stray cats from sneaking in their homes. Top it all off with some local wine sampling (just as Dionysius, the Greek god of wine would’ve wanted you to do). 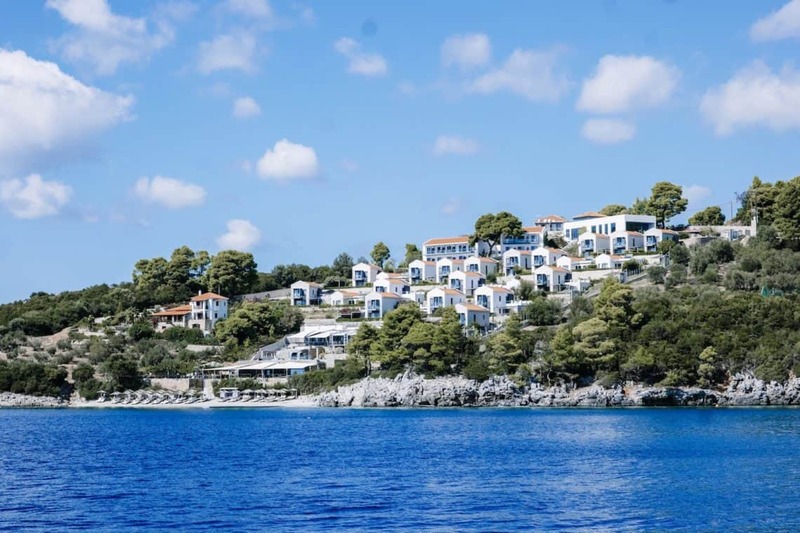 Check out Dolphin of Skopelos to arrange a tour. Explore the island’s scenic interior as you peddle past sweet pine forests and plum orchards. Cycle between beaches on paved roads, or explore the back road trails (With plenty of climbing and trails that range from single track to off road trails, to goat tracks). Renting a bike is one of the best ways to access the island’s most remote natural settings, pick a few sun-soaked figs along the roads, and enjoy! The island is 50% forest after all and is a mountain biker’s haven. Ask for Panos as Skopelos Cycling, who will help you select a route and adventure for your skill set. He is amazing and will outfit you with high viz-gear, quality mountain bikes, and will send you off with a pre-marked map and show you where to get water along the way! 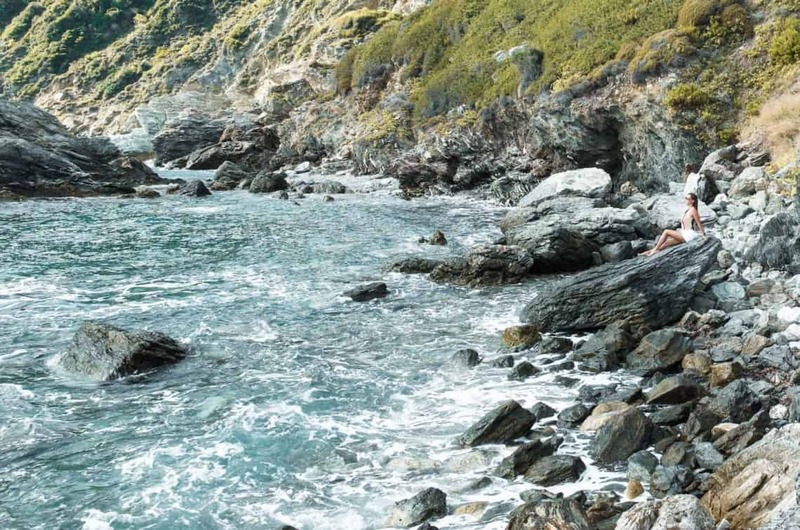 Pro Tip: One of the most scenic routes is from Skopelos to the charming fishing village of Agnodas. One of the best ways to take in the deep blue turquoise waters of Skopelos is via kayak. Explore deserted beaches, mysterious caves, and rugged cliffs as you paddle past monk seals, dolphins, massive tuna, and turtles. Luxuriate in the warm waters of the Aegean sea and embark on a day trip, or, for the adventure inclined — book a multi-day paddle expedition to Europe’s largest Marine Animal Research center. Kayaking Greece kills it time and time again. Ready to empty your bank account and travel in the footsteps of Meryl Streep and Pierce Brosnan?! There’s more to this emerald island than Mamma Mia! Escape to this handsome island as soon as you can, and keep us posted!